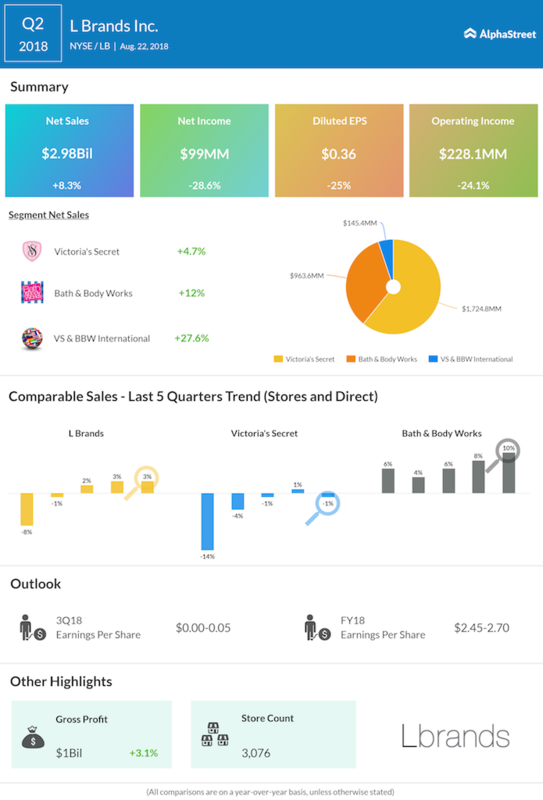 L Brands (LB) reported a 29% dip in earnings for the second quarter due to higher costs and expenses. The top and bottom line exceeded analysts’ expectations. 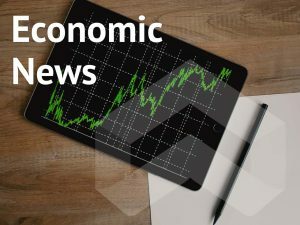 The Columbus-based retailer lowered its earnings outlook for the full year 2018 due to the deceleration in PINK. The stock dropped more than 7% post the earnings release on weak guidance and retirement of the executive chief of Victoria’s Secret PINK. The company also said Denise Landman, CEO of Victoria’s Secret PINK, has decided to retire at the end of this year. Amy Hauk, currently President for Merchandising and Product Development of Bath & Body Works, will replace Landman as CEO of Victoria’s Secret PINK. Landman will remain in the business through the end of the year to onboard Hauk and facilitate the transition. Net income declined by 29% to $99 million or $0.36 per share in the recently ended quarter. Net sales increased by 8% to $2.98 billion, helped by square footage and international growth, the adoption of the new accounting standard and the calendar shift resulting from the extra week last year. Comparable sales for the owner of Victoria’s Secret, PINK, and Bath & Body Work brands jumped 3% compared to last year. The e-commerce growth on brick and mortar retailers had a negative impact on L Brands. The company has been struggling to keep the store sales at Victoria’s Secret in line with customer expectations but the segment recovered slightly from last year. On a brand basis, Victoria’s Secret narrowed its comp sale decline to 1% from a 14% decline last year. Sales rose by 5% in the lingerie chain to $1.7 billion. At PINK, comps fell in the mid-single digit range for the second quarter, due to declines in both lingerie and loungewear. Swim, which the company is exiting, had a negative impact of about 2 points to the total comp. At Bath & Body Works, comp sales witnessed 10% growth. For the third quarter, L Brands expects EPS of $0.00 to $0.05 and comps to rise in the low-single digit range. Sales in the third quarter are predicted to be about 2 points higher than comps. For full-year 2018, the company lowered its EPS guidance to a range of $2.45 to $2.70 from the previous estimate of $2.70 to $3.00. For 2018, the company predicts comps to be up low-single digits and total sales growth to be about 3 to 4 points higher than comps. L Brands projects 2018 capex to be between $625 and $650 million, about $50 million lower than its previous estimate. Turning to liquidity, free cash flow is anticipated to be about $800 million. Shares of L Brands ended Wednesday’s regular session down 0.06% at $32.49 on the NYSE. The stock has declined more than 46% year-to-date and more than 11% in the past 12 months.